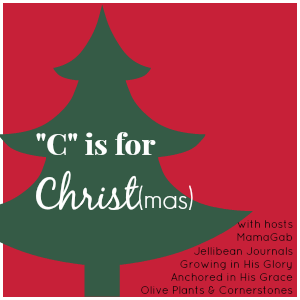 We’re putting the Christ in Christmas this week, sharing intentional and doable ideas to focus on our Savior in the “C” is for Christ(mas) series. 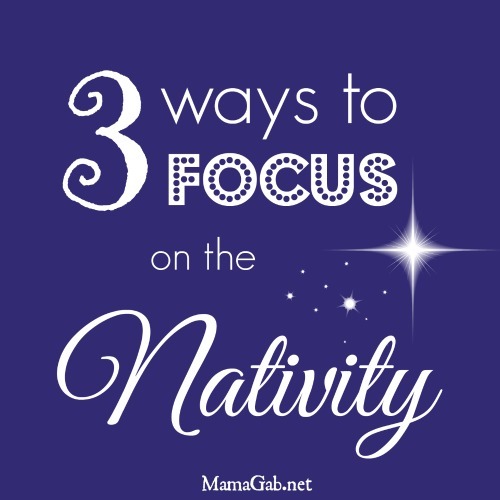 Today, Gabby from MamaGab is featuring three ways to use the nativity to highlight Jesus this Christmas. Where’s baby Jesus? Jesus hide-and-seek of sorts is my fave of the three creative and purposeful traditions she shares to keep Christ in the center of family holiday celebrations. Check out Gabby’s playfully purposeful nativity activities and be sure to read up on the other posts we’ve featured in this series. Don’t forget to link up all your holiday post goodness & treats with us at tomorrow’s Christmas linkup! Just in time…My three year old is all about santa & presents…which I think is adorable. But his little sponge of a mind needs to know the true meaning! Thanks for the post! Lauren, isn’t it fantastic to see the sparkle in our little ones’ eyes this time of year? I’m so glad you found some new ideas for adding a dash of Jesus to your holidays. Hoping you and your family have a wonderful Christmas! See you around soon. I love Christmas music too. In fact, when my daughter was born it was October and I was already listening to Christmas music. I decided then and there that her naptime lullaby would be a Christmas song, and so it is. Hers is “O Holy Night” and my 4 month-old son gets mommy’s rendition of “Hark the Herald Angels” daily. I love it! My daughter now sings her night night song to her dollies too. Super cute. Thanks so much, Nat, for stopping by today. I hope you and your family have a beautiful Christmas.